[soliloquy id=”4474″]A bedouin coffee party. An old man playing a rababa, its body sparkling and inlaid with mother-of-pearl and blue stones. A tourist kneeling in the middle of the bedouin coffee party, pointing at the beautiful rababa inlaid with mother-of-pearl and blue stones, his face very close to the singing old man, smiling for a little too long while his partner takes a picture with her phone. A window washer hangs from the taller World Trade Center tower, perched over the scene watching the swarms of visitors as the sun begins to set. Why is he still up there? A fisherman casts a wide net into a body of water in which there are no fish. The salty smell of fish in a fishless, man-made sea. The crowd ebbs and flows: hundreds of abayas, thousands of kanduras, a sea of rubber flip flops and wriggling toes with chipped polish. Three teachers get henna in the traditional Emirati style. Their hands look like lumpy spiders. A preteen boy with three cameras around his neck bumps into one of them, smearing her henna on her sleeve. Another teacher pours water from a Masafi bottle as she tries to scrape it off, but all she does is rub it into the denim as the muddy water drips onto the sand and between her toes. The smell of the dye lingers as they depart for the saluki park. Helvetica signs that say HERITAGE. Bad typesetting spells dwindledtothepointhweremanyspeciesarenowendangered. The seas are over-exploited. The sign implies that should probably not eat hammour if you want to be sustainable. 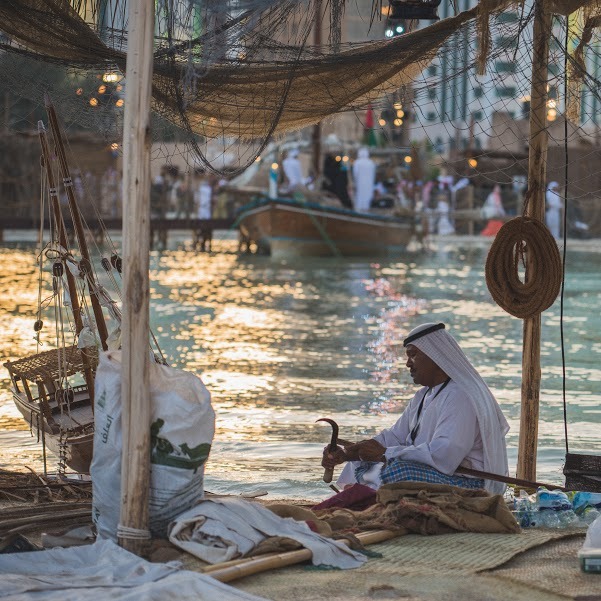 Old shipbuilders with a rusty awl, their dhow perpetually under construction.Palm fronds on the ground and chanting that sounds like it’s emanating from the earth, but is actually blasting from a speaker muffled with a burlap sack. A British man expertly explains the burqa to his wife, referring to it as a “face mask.” A man with a belt made of bullets, holding a gold-plated gun, stands in front of a police station. The line of his rifle barrel points to a sand pit full of children in orange vests, digging. A poster explains the growth cycle of date palm fruit. Can you eat them when they’re green? No, you cannot. But when they’re just slightly unripe you might be able to make juice out of them. A sand bag with a fax number on it. An LED billboard across the street, advertising the QASR AL HOSN FESTIVAL. A festival celebrating a fort that you are never allowed to enter. A prayer rug on the sand. A tree with fat beanpods, hanging. A man swinging an axe at a date palm. A minaret perfectly aligned between two glassy buildings. A small boy holds a large falcon. A smile with missing teeth. A toddler in a tiny kandura is placed on a pony against his will. La, ‘ami, la! An anchor stuck in a gleaming fishing basket. A woman in a burqa atop a camel. A man sitting on a pile of crates, wearing a tartan skirt and taking a swig from a clay jug. Wheelchair hubcaps painted with the UAE flag, black slowly fading to red, to green, to white as the owner wheels up a ramp onto a boat. Children with gold tangled in their hair. You can go to the Emirati Salad stand to learn about the edible plants of the region. The first bush looks familiar. “I think I’ve eaten that one! Do you pickle it?” He asks where, eyebrow raised. “…Georgia?” Well – it is a desert plant, he explains. He doesn’t think you ate it in Georgia. He chuckles and gives you a bite of a succulent-type thing that tastes like a sour cucumber. A family of five eats legaimat on the ground, leaning against a dune in the corner behind the houbara enclosure. Cardamom fog lingers in the air, and you can hear the syrupy rosewater dripping back into the paper bowl, or at least you think you can. Spotlights shooting from the turret of the fortress, hazy in the night sky and stretching upwards to converge in a many-pointed star. The effect is such that, when you first notice them, you think the rays are coming down from between the clouds, illuminating the tower with heavenly light.